Escape the Cancerverse with the rescue of Rich Rider! At last: the secrets behind Earth’s original Nova Richard Rider’s survival in the deathless reality called the Cancerverse will finally stand revealed in May 3’s NOVA #6. The hows and whys of the original Human Rocket’s time on that horrible plane depend upon writer Jeff Loveness, so we braved a brief visit with him to ask for the terminal tour, one that may illuminate the secrets he’s about to unveil. Imagine untold stretches of corrupted space swirling about an unending radiance of expanding gloom. Sometimes referred to as Earth-10011 and roughly corresponding to our own planet, the sick ball of rock and mud reflects the dark universe around it. No gnarled version of Earth would be complete with out a topsy-turvy take on the mighty Avengers. “Not only do you have these Many-Angled Ones and Cancerverse monsters running around, you’ve got twisted, rotted out versions of the Avengers trying to tear you apart…even though you can’t die,” Loveness explains. “It’s an endless spectacle of torture and savagery, just for the sake of it. Undead images of the famous mutants? Yes, the Cancerverse boasts that, too. “I don’t want to say too much, but there’s a big twist and a mystery Nova villain we haven’t seen in a while that’s been behind all of this,” the writer teases. “Someone who’s very close to Rich. 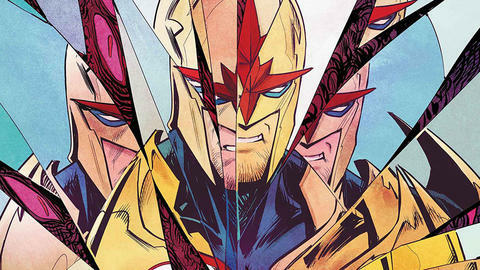 Brave the Cancerverse with Jeff Loveness and Ramon Perez on May 3 with NOVA #6!